Label Print Canada – Label Printing Canada, Your Custom Label Company! 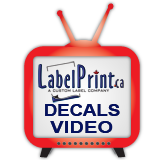 Canada’s trusted label printing source for product labels, custom stickers, domed decals and embossed foil seals. Domed decals made of outdoor durable, flexible, crystal clear, two part polyurethane. We also offer doming-only services to the print industry! Labels for any use and industry. Spot or full color Printing in short or long runs. Available in a wide selection of materials and finishes. Barcode labels and product labels for any type of product and any industry for hand or machine application. Our high quality domed decals are made with a premium two part polyurethane that cures to a flexible, crystal clear surface that will withstand years of use. Elegant and timeless deep embossed foil. Over the last 18 years, we have helped thousands of businesses across North America get great label products at a great price. Check out our customer testimonials and see why Label Print is simply the best. Ordering labels is easy! It all starts with a simple quote request. For a step by step walk-through of the order, proofing and production process – check out this short video. Labelprint.ca is owned and operated by Sticky Business Inc., Canada’s premier label printing service located in beautiful Victoria, BC. We have provided our clients with quality custom labels, world class customer service, easy online quoting, fast turnaround times and affordable prices for over 17 years. Whatever your label printing project requires, we are here to help you get the best product at the best price possible. We offer a full selection of custom label printing options, including digital labels, embossed foil seals and polyurethane domed decals. We take pride in every order we produce and look forward to working with you every step of the way. CALL TOLL FREE 1-866-474-1095 to get your label project started today! We offer a huge selection of custom label printing options. If you can’t find it on our site, simply give us a CALL TOLL FREE 1-866-474-1095. We print labels for product packaging, digital labels, company asset tags with serial or variable numbers, gold and silver foil labels, tamper evident labels, embossed labels, foil stamped, roll labels, labels on sheets, domed labels, personalized beer and wine labels and much more! We offer fast turnaround times,SUPER RUSH service options and friendly customer service. If you need durable, weather or abrasion resistant custom decals for outdoor, sporting or industrial applications, our digital, flexographic or screen printed decal options will provide all the strength you need. We produce high quality, durable decals for all industries and applications including heavy industrial equipment, hard hats, sporting goods, cars, trucks, motorcycles, boat dealerships and more. If you’re unsure about what product would work best for your special application, just give us a CALL TOLL FREE 1-866-474-1095. We’re here to help! Choose from our selection of standard bumper sticker sizes, shapes and ink colours or customize your own bumper sticker to your exact specification. Our durable, weather resistant vinyls, inks and laminate stocks will stand the test of time and the elements for years to come. Short run or high quantity printing, spot colour or four colour process – we have the latest printing technology to produce any quality custom bumper sticker you can imagine. Nobody beats the quality and durability of our custom domed decals and stickers. Our domed decals are crystal clear, non-yellowing, durable and flexible and can be produced in any size, shape or colour! We use high quality, two-part polyurethane doming resin that produces a superior product to cheap epoxy alternatives. We offer great pricing and a great product – produced right here in Canada! Short and long runs with NO SETUP FEES! Celebrate your business anniversary with our elegant anniversary seals. Choose one of our 6 styles in brite GOLD or SILVER foil with contrasting red, green, black or blue ink. Anniversary seals are a great way to show your customers that your company is trustworthy and here to stay. FREE typesetting, FREE standard inks, NO SET UP FEES, FREE digital proof and fast turnaround time. We also offer the option of a gorgeous digital image rendering of your design, perfect for your website. For a truly elegant addition to certificates, stationary or presentation folders, product packaging or artist signature piece – our custom embossed foil seals offer affordability and sophistication. Choose from a great selection of standard foils and inks and an extensive catalog of sizes and shapes. Or, for a truly customized look – we can create a custom shape designed just for you.